There are so many different types of pet food, it can be hard to choose what is the best for your darling hound or feline. A new study has examined pet nutritional preferences to find out what they really need. For the study, 17 healthy adult dogs and 27 cats were recruited and observed over a period of 28 days. Each day, each animal was given a choice between four food types that differed nutritionally: high-fat, high-carb, high-protein, and balanced food. However, one important factor was kept constant: all of the foods tasted equally good! Therefore, the animals ate according to their nutritional requirements and not to taste preference. The food bowl position was switched daily to prevent any food bowl bias. The dogs were given an hour each day to eat as much as they wanted, up to a predetermined caloric threshold. Cats had constant access to food but they were also limited to a certain number of calories per day. The reason for this calorie limit was to make sure that the animals just got the calories that they needed for their metabolism and to maintain weight. In the end, dogs got 41% of their calories from fat and 36% from carbs, while cats got 43% from carbs and 30% from protein. This result is in contrast to the widely held belief that cats need a lot of protein. A possible reason for this difference in results is that previous studies have used food that tastes different. In this case, cats do eat more protein and dogs eat a lot of fat. However, no dog or cat got the highest percentage of its calories from protein. The animals’ age and amount of muscle also influenced what they preferred to eat. Younger cats with less muscle mass ate more protein than older cats. In contrast, young dogs ate the lowest percentage of protein, and dogs with a higher mass of body fat got more calories from protein. 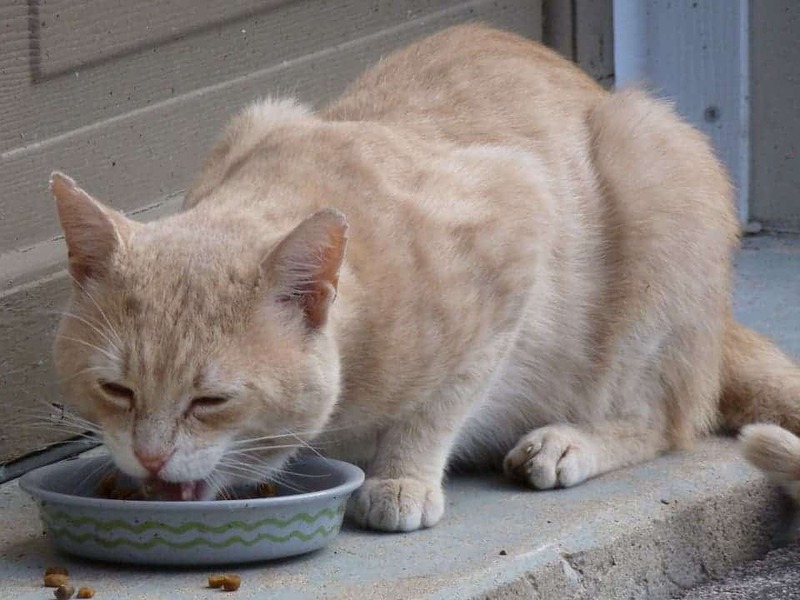 Old cats weren’t able to break down proteins so well and had higher amounts of catabolic products that are connected to cardiovascular and kidney disease in humans. That means that older cats shouldn’t eat so much protein because their bodies can’t deal with it and food chosen especially for older cats should contain less protein. This study does assume that animals will choose their ideal diet when given the chance. It’s hard to say if preference necessarily means that it is better nutritionally. Some animals eat things that aren’t necessary good for them often (how do dogs always find the chocolate). Backing it up with studies on the animal’s health (like done here for the affect of protein on older cats) is also needed.